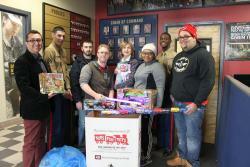 SGA students Jhon, Tyler, Jennifer and Dylan, along with SGA moderators Roman Sierra and Dr. Judith Lilleston delivered toys contributed for this year’s Toys for Tots to the Marine Corps Reserve. The whole CW family is happy to know that we’ll be helping make a child’s wish come true. It’s all about the holiday spirit of compassion and giving!